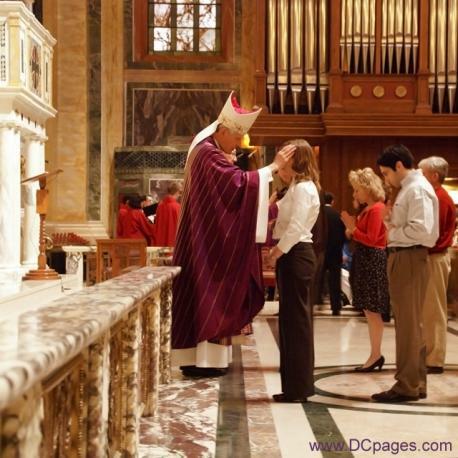 In Washington, DC, Washington Archbishop Donald W. Wuerl celebrated Ash Wednesday Mass at the Cathedral of St. Matthew the Apostle. Lent, in most Christian denominations, is the forty-day liturgical season of fasting and prayer before Easter. Ash Wednesday is a time for repentance and it marks the beginning of Lent. The Cathedral of St. Matthew the Apostle plays a leading role in the nation's capital as the center of its Roman Catholic community. St. Patrick's Day is a time to celebrate shamrocks, leprechauns and enjoying the golden bubbly. On Saturday, March 10, over 40 local and national bands performed on 8 stages at the 2007 Shamrock Festival. 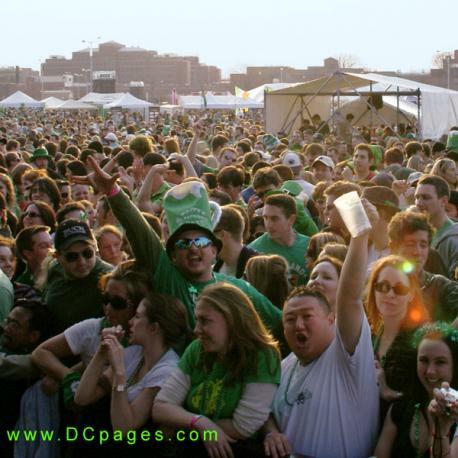 The all-day festival was the biggest St. Patty's Festival in the history of the DC area. Jugglers, comedians, and magicians provided entertainment throughout the day while vendors sold everything from Irish crafts to beer throughout the grounds. Whether or not your ancestors were Irish it's fun to celebrate St Patrick's day in Washington DC. Our parade is a fun time for the lads and lasses! 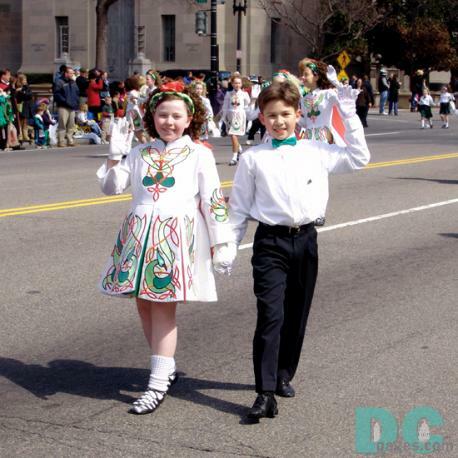 The Parade is an Irish community endeavor that was started by the Irish American Club and is now held in cooperation with the National Capital Park Service. The parade starts at 11:30 am until approximately 2:15 pm on Constitution Avenue. Washington DC has many homes beautifully lit up for the holidays. If you have young kids, grab some hot chocolate, hop in your car, and drive around our neighborhoods. 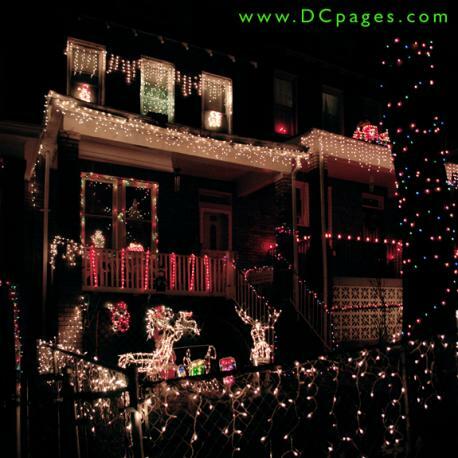 District of Columbia residents have put a lot of time and effort into decking our city with dazzling displays and decorative delights. Drive slowly as you gape at the multiple houses that are blazing with lights. From Santa and candy canes, to inflatables and nativity scenes, our staff photographed some spirited displays that are worth a look. 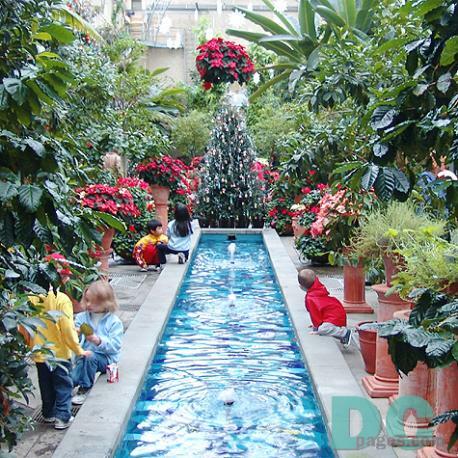 The U.S. Botanic Garden's holiday display recalls the post-World War II holidays when families were reunited, a peaceful future beckoned, and celebrations had developed a distinctly American style. Hidden from plain view, the world reknown city planner and Freemason, Pierre Charles L'Enfant, crafted a path for the enlightened to follow. 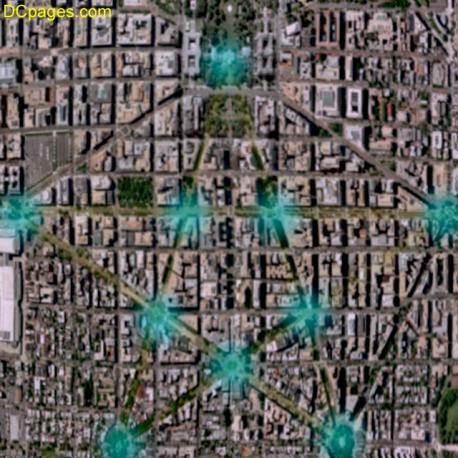 Emanating from the East Portico of the United States Capitol building to Lincoln Park is a hexagram star pattern that can only be noticed from high above. Nations, cultures, and religions have have used this ancient symbol to represent their beliefs, government and money. Many historians believe this six pointed star invokes a higher esoteric form of spirituality. While traversing the streets of Capitol Hill, one can only speculate the grandeur influence this talisman has on American history. 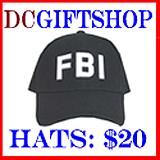 Come view the neighborhood of Washington's power brokers and decide all these things for yourself - you may even discover some hidden symbols known only to a few. Wasington has a secret. The Capitol Square and Compass tour reveals a hidden framework of symbols thunderous enough to rouse the gods within our mind. Walking this ancient trail may change the way you think about Washington or reveal a secret mystery. 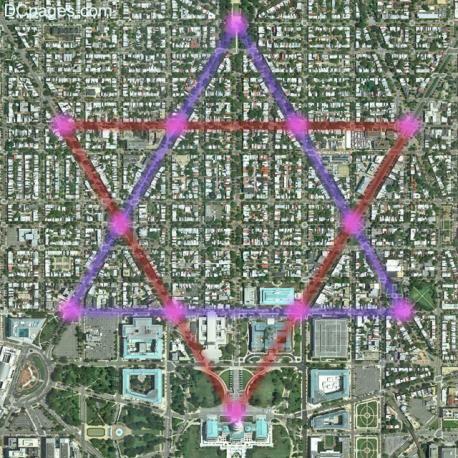 To truly understand meaning of Washington's square and compass you need to follow the path disclosed to you. On this journey you will need to master your thoughts to only Washington's buildings, monuments and memorials. Enter the world of our Founding Fathers and understand the deeper meaning of ancient words and positioned symbols etched on its walls. You will start in darkness and head East toward the light of virtue. There is a nautical star in our nation's capital. Journey through the streets and alley ways that make up the star of Washington. 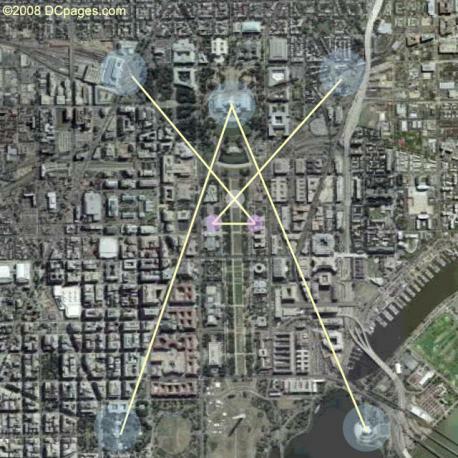 Pay close attention to the hidden symbols that teach a broader meaning of our capital city. Pythagoras would have recognized this Pentagon-Dodecahedron as insight to the golden intellect of our nation's founder. A fixed star was selected to guide wise men to the source of human enlightenment. 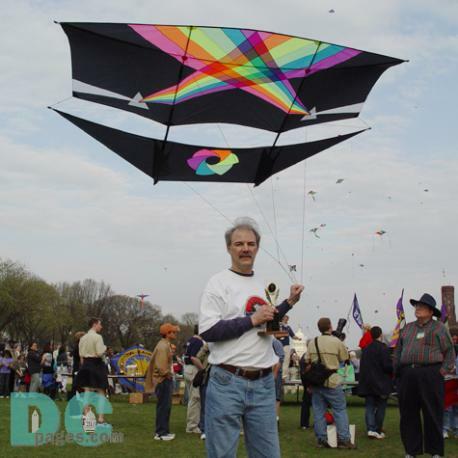 Founded by aviation pioneer Paul E. Garber (1899-1992), the festival, one of the kite world's premier events, is sponsored by The Smithsonian Associates and the National Air and Space Museum, and features kite fliers from across the U.S. and the world. Traditionally a part of the festivities at cherry blossom time in the Nation's Capital, the Smithsonian's colorful Kite Festival is one of the most popular annual events held on the National Mall. 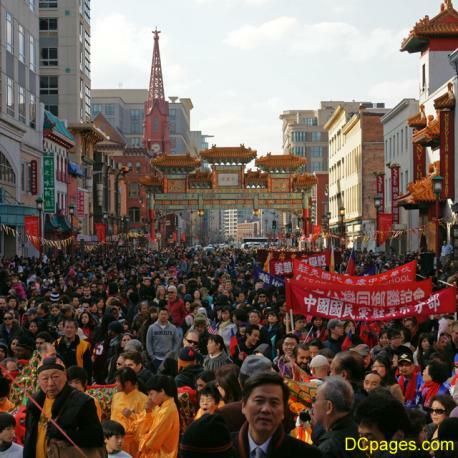 Each year a parade is held in Chinatown in Washington, DC to celebrate the Chinese New Year. The event features the traditional Chinese Dragon Dance, Kung Fu demonstrations and live musical entertainment. The Chinese New Year is a 15-day event that starts with the New Moon on the first day of the new year and ends on the full moon 15 days later. The first day of the year can fall anywhere between late January and the middle of February. Chinese New Year is the longest and most important festivity in the Chinese Lunar Calendar. The origin of Chinese New Year is itself centuries old and gains significance because of several myths and traditions. Ancient Chinese New Year is a reflection on how the people behaved and what they believed in the most.